1. Preheat the oven to 200˚C, gas mark 6. Scrub the sweet potato skin, pat dry and cut into 5x2cm pieces. Place on a large roasting tray and toss well with the olive oil. Place in the oven and roast for 15 minutes until starting to soften and just golden at the edges. 2. Add the kale and toss well. Return to the oven for a further 5 minutes, tossing halfway through. 3. Meanwhile, mix together 1 tbsp of the sesame oil, the sesame seeds, soy sauce, mirin, Sriracha and ginger. Place the pork strips in a large bowl, pour over the sauce and mix well. 4. Heat the remaining sesame oil in a wok or large frying pan and cook the pork and sauce over a high heat for 2-3 minutes then add the salad onions and peppers and continue to cook for a further 3-4 minutes until the pork is cooked and the sauce has reduced. 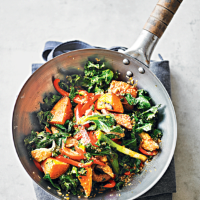 Toss in the sweet potato and kale and mix well then serve immediately.